Hello from Oklahoma City, Oklahoma! This is a picture of my daughter, Taelyn's, dinner. She is three years old and loves to eat! 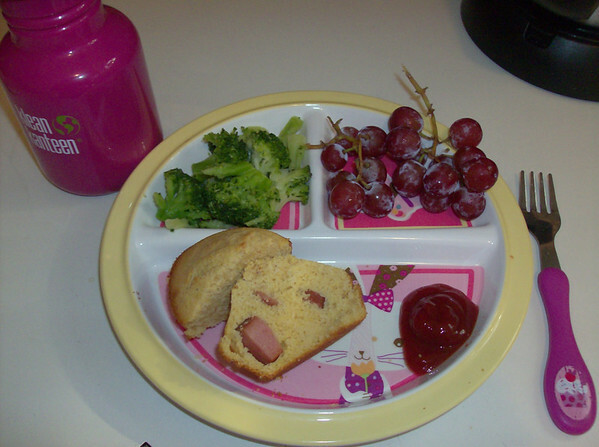 What we have is a corndog muffin (just a cut up hotdog inside of cornbread) with ketchup for dipping, broccoli, grapes, and water to drink. Food-o-meter: She loved it...especially the grapes! Dessert: Yes, she got dessert because she ate all of her dinner! VEG's DadTo have your early years breakfast, lunch or dinner featured please send to NeverSeconds@gmail.com , thanks! Hello, Taelyn's mum! I've never had cornbread, is it at all like polenta? I can't imagine the taste. Grapes are the best, well done to Taelyn for eating it all. You make it sound delicious, Renda, but I am still in the dark when trying to imagine the taste. Does it resemble anything we have in the UK? Is it sweet or savoury? Right now I'm picturing a sweetcorn muffin made with cous-cous ( do they even exist? !i hope not!). I'm Portuguese and we have cornbread too! It's savoury and you treat it just like you would bread, I love it toasted with butter but some people prefer it as a meal accompaniment, to mop up sauces and whatnot. Renda, I don't know if it's exactly the same as American cornbread but I'm guessing it's pretty similar (also dense and coarse in texture). You should check if there are any Portuguese bakeries / grocery shops in your area as you can often get cornbread there (Broa de Milho in Portuguese). American cornbread can be sweet or savoury. Growing up we had a cornbread baking tray that made cornbread sticks shaped like corncobs! I always made mine with honey so that it had a sweet taste. It's hard to describe the texture. A bit coarse and crumbly. My parents used to break it up into a glass of milk and it was coarse enough to stay firm without becoming mush. I can't really think of anything in the UK that comes close. It's a quick bread in that you don't need to add yeast. It will rise some when you bake it but not too much. I've also made it in a square baking tray and added tinned sweetcorn, jalepeno peppers, grated cheese and sour cream. Usually to have with chilli. Corn muffins are similar to regular cornbread but a bit softer and usually quite sweet. Cornbread is also used in stuffing for turkeys! I'm sure if you searched online you can find lots of recipes for cornbread. It's worth trying at least once. The corndog muffin in Taelyn's dinner is based on a corndog - a hotdog on a wooden skewer dipped into cornbread batter and deep-fried. Very popular, especially at county fairs and carnivals! I'm getting really hungry now! Me too, my tummy is rumbling! You've convinced me! I'm going to get polenta flour ( i've googled cornmeal and that's what it looks like!) and try to make it at the weekend.The one with jalapenos and cheese sounds particularly good although I'll add a few frankfurters in honour of Taelyn :)). Great seeing the young ones getting their fruit and veg. Love the idea of the corndog muffins! I'm going to try that! Again, as Renda said, a Google search should get you plenty of hits for recipes for making cornbread. For those not in the States, yes, just substitute polenta flour. Polenta is ground just a bit finer than most corn meal, but that won't really matter in your finished product. It may just not be quite as "grainy" as it would be otherwise. But it will taste the same. One last "old-timer's" trick: instead of using just a regular cake pan, if you have a cast-iron skillet, use that. (For a typical recipe, a 10-inch skillet works well.) Preheat your oven to 200 degrees C. (gas mark 6). Put a bit of ground nut oil (higher smoking point) in the skillet (enough to coat the inside, plus just a tiny bit more) and put the skillet in the oven to preheat. When the skillet is "smoking hot", remove it from the oven (careful the handle is HOT!) and pour in your cornbread batter. Return it to the oven and bake as directed. It's the "crust" that everybody loves the most about cornbread. Baking it in a cast-iron skillet will cause the bottom to get all nice and toasty golden-brown, as well as the top. Thank you! My daughter LOVES hello kitty and actually had a HK themed birthday last year! I guess I gave it a 9/10 because it was a hot dog and it is one of the more higher fat proteins out there.